This article is about the video game. 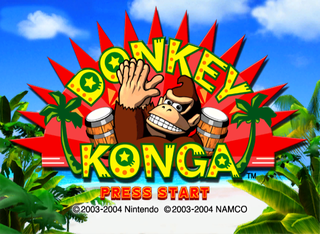 For the series with the same name, see Donkey Konga (series). Donkey Konga is a Donkey Kong video game for the Nintendo GameCube. It was developed by Namco and published by Nintendo in 2003 in Japan and 2004 overseas. It is the first installment of the Donkey Konga series. 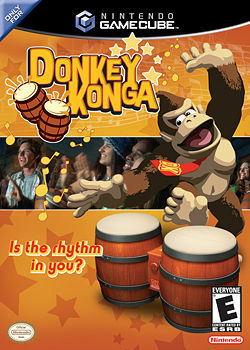 Donkey Konga is notable for being the first game to be compatible with the DK Bongos. Donkey Konga eventually received two sequels: Donkey Konga 2 and the Japan-exclusive Donkey Konga 3: Tabehōdai! Haru Mogitate 50 Kyoku. Donkey Kong realizes the potential to become famous from playing bongos. Donkey Kong and Diddy Kong are strolling across a beach and suddenly find a mysterious pair of barrels. DK attempts to open it but is stopped by Diddy, who believes it is a trap from King K. Rool. 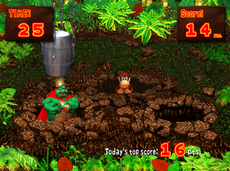 Following Diddy's advice, the duo take the barrels to Cranky Kong. Cranky chuckles and explains that they are bongos. DK decides to call them the "DK Bongos", and he plays on them. Diddy comments that DK is bad at the bongos, and he tries the bongos. DK, in turn, laughs and claims that Diddy plays the bongos poorly. He claps, which cause the bongos to glow. Cranky explains that the instrument glows and makes noises from detecting clapping. In response, Donkey Kong and Diddy perform and clap with the bongos more. 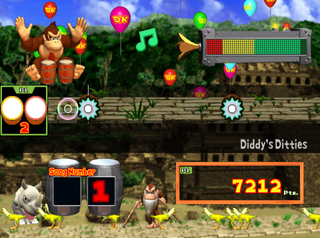 After they make a lot of loud noise, DK becomes discouraged and admits that him and Diddy are not good at playing the bongos. Cranky explains that nobody starts out as a professional and that their performance gradually improves from practicing. DK initially mentions his dislike of practicing but suddenly has the idea to become good at the bongos and become famous, which Cranky believes to be a possibility. DK and Diddy daydream and focus on becoming rich and owning lots of bananas. Cranky sighs and reminds them again to practice, which the two head out to do. The main gameplay is largely identical to the Taiko no Tatsujin games, which were also designed by the same developers. 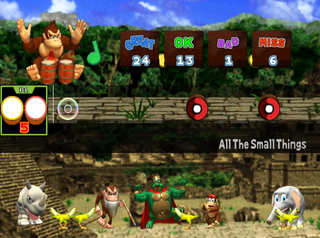 The player has the option to utilize the DK Bongos or a standard GameCube controller. During gameplay, the player controls Donkey Kong, whose goal is to hit scrolling notes, known as beats. They must hit it with accurate timing when it moves under a cursor on the far left. There are four types of beats (red, light blue, yellow, and purple), and are each associated with a different button. A word appears on screen for every passing note, and the displayed word is based on the accuracy of the player hitting the beat. A combo is displayed if the player hits two or more consecutive beats, but it vanishes if the player misses a beat. 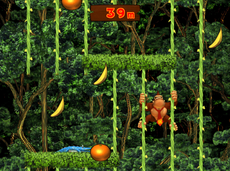 All four gameplay modes (except Challenge) have three levels of difficulty modes, from lowest to highest: Monkey, Chimp, and Gorilla. 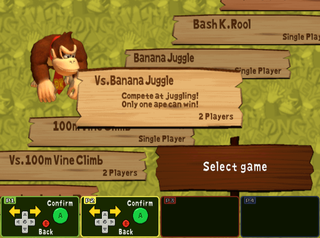 The second player plays as Diddy Kong in multiplayer modes. 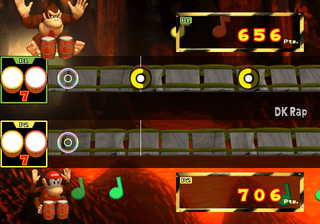 Every song has a varying number of beats, which is indicated from the number of barrels next to their titles on the selection menu. Street Performance Based on the concept of street performance, Donkey Kong can perform songs and earn Coins, which he can use to purchase unlockables at DK Town. During gameplay, Donkey Kong earns two coins for every beat that he hits with perfect timing, or one coin for regularly-timed beats. A coin counter appears next to Ellie at the bottom-left with a self-explanatory purpose of keeping count of the number of collected coins. Additionally, a bar appears at the top-right corner that tracks how many notes the player hit. A "CLEAR" label appears in the center, and it divides the bar into two color-coded segments, red and yellow, which respectively represent poor and good performance. The bar gradually fills up for every note hit by the player, but it contrarily decreases for every missed note. 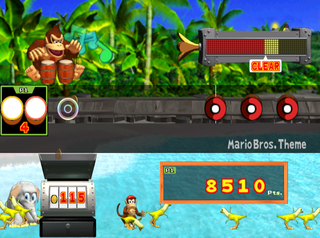 The results are calculated after the song ends; Donkey Kong wins if the bar fills past the Clear label and keeps the Coins that he obtained on the way. If Donkey Kong loses at a challenge, he does not keep the coins. The player can purchase individual songs to perform on Gorilla (expert) difficulty. 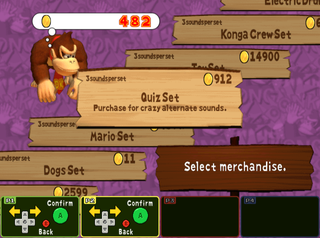 The player can purchase alternate sounds for the bongos to make during gameplay. 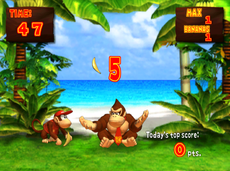 The player can purchase three mini-games to play in the ape arcade, two of which have a 2-player competitive (Vs.) mode. 100M Vine Climb 4,800 coins Single player: "Climb vines and collect fruit to set records!" Multiplayer (Vs.): "Climb vines and collect fruit to be the king of the Jungle! Banana Juggle 5,800 coins Single player: "Juggle bananas and set records!" Multiplayer (Vs.): "Compete at juggling! Only one ape can win!" Bash K.Rool 5,800 coins "Slam King K.Rool back into the ground. Go for high scores!" 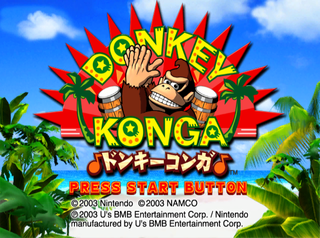 Donkey Konga features around thirty songs, most of which differ between regional release. Every region has songs that originate from other Nintendo titles along with traditional music, including kids' medleys, pop and classical. Almost every traditional song was made into a shortened cover for the North American release. Aside from a different set of songs, Donkey Konga's North American logo is different from the European and Japanese logo. This change is reflected both in-game and on each region's box cover. The Japanese logo has a subtitle, which western versions do not have. Every title screen depicts a scene of the beach, but the North American one displays a different scene from the European and Japanese versions. The latter two depict a straight view of the beach, which is partially obscured by the game's logo. 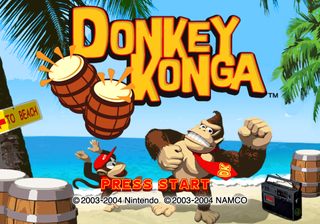 The North American title screen shows Donkey Kong and Diddy Kong partying at the shore, complete with a pair of bongos and a boombox in the scene. The logo on the GameCube menu banner is also different between regions. The Japanese version has a start-up warning advising players to be weary of vibrations, the sound and the amount of time they play. This warning is absent from the North American and European releases. 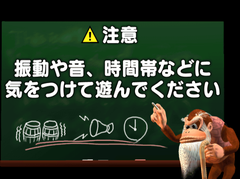 A health and safety warning is featured in every regional release of Donkey Konga 2, but this exact warning was also featured in the Japanese version of the sequel. Nintendo Gamecube Tom Bramwell, Eurogamer 6/10 In the end, Donkey Konga is just too short-lived, even in multiplayer, to be worth the sort of outlay it represents. Nintendo has been surprisingly generous in its pricing here - most people will sell you the game and a set of bongos for £30 as far as we can see, and extra sets run to just £20 - but with the songs already shortened (and covered by a fairly decent bunch of impersonators, rather than licensed, curiously) Donkey Konga just doesn't have the legs. We appreciate the simplicity of the idea, but in the absence of the hidden depths we normally expect from this sort of game - or the ritual humiliation we now demand - it ultimately wears thin far too quickly. And for that reason we can't see it becoming the eBay legend that Samba was, although we've little doubt that you'll be able to find it on there all too quickly. Nintendo Gamecube Juan Castro, IGN 8.5/10 Donkey Konga packs hours of fun. It's a good single-player experience and a great multiplayer one. If you can round up four buddies and four bongo controllers, you're set for the evening. All that's missing in a room with this game (and four bongos) is booze and a bowl of Tostitos. A somewhat limited song selection is the only thing keeping the multiplayer aspect from being the greatest thing EVAR, so to speak. The graphics, while bland and lacking several layers of polish, get the job done without causing too much of an eye-sore. The mini-games offer a little fun, but your best still sits in Kongo's primary game modes. For this subject's image gallery, see Gallery:Donkey Konga. Donkey Kong - When choosing whether to display the screen in 50Hz or 60Hz, Mario (as he appears in Donkey Kong) acts as a cursor and Donkey Kong stands to the left (also as he appears in Donkey Kong). Donkey Kong 64 - Donkey Kong, during the "K. Rool Bash" mini-game, can be heard saying "Hey! ", "Cool! ", and "Yeah!" throughout. Also, the Melee version of the DK Rap appears in the game. Super Smash Bros. Melee - The tracks "Rainbow Cruise," "Super Smash Bros. Melee Opening," and "DK Rap" are taken from this game. Super Mario Bros. - The track "Mario Bros. Theme" is a remix of a track from this game. Donkey Kong Country - The track "Donkey Kong Country Theme" is a remix of a track from this game. The Legend of Zelda series - The Legend of Zelda Theme is featured on the North American, European and Australian versions of the game. Kirby: Right Back at Ya! - The Japanese and North American releases both include the anime's theme song. Pokémon (anime) - The North American release includes the anime's theme song. This page was last edited on April 6, 2019, at 14:55.